Hello and welcome... to yet another edition of the most comprehensive coverage in the world, of the annual Transformers BotCon convention. (possibly the non-American who has been to the most BotCons, or at least the one who has travelled the most distance to BotCon over the years). STATUS - 14th May - COMPLETE - 38 pages & 957 images. After a more disappointing BotCon than usual in 2015 for me (and other long timers it seemed), along with Fun Publications deflecting responses to over-charging their International customers and actively taking measures to prevent us from claiming a refund, I wasn't planning to attend this year when it was first announced in September last year. But by around January when it looked like it was going to be the last one, I changed my mind just before pre-registration began, which didn't leave me with much time to start saving up for it (the registration, the flights, the hotel, the at-show toys, and spending money). As such, just like the last time we had a "last BotCon" (in 2004), I ended up with about $50 to spend at the convention in the Dealer Room. Because of the short planning and saving time on this one I had to keep the trip short and cheap... with the barest number of nights possible, of just five in Louisville, preventing me from doing much outside of the five days of the Convention. I also had to make sure that I was sharing with someone to half the cost of the room, plus having to sell a large number of toy items that were heavily discounted just to get them to sell before I left. In the end it was worth going, despite the limited time and funds over there, as it gave me the chance to meet up with some people I hadn't seen for several years... as well as get a sense of closure, because I think that if there isn't another Convention called "BotCon" within 2 years, or even an officially endorsed Transformers Convention of a similar dedicated-fan focused format, it just won't be worth it for someone like me on the other side of the world, who has to spend about $5000 on each one (or about $3500 for the pre-FunPub BotCons). And I get a sense that many would also need a similar type of convention to come back again, so it really did feel like I would never see these people in person again. And after 17 of these BotCons and Official Cons, every time I think about that, it really gets to me... even now, some weeks after the convention. Before departure - News and my planning before the start of the Convention (START HERE after this INTRO PAGE if you want to go through EVERYTHING in chronological order) - Completed May 7th. April 6th - Wednesday - Brisbane to Louisville & Package pickup (START HERE after this INTRO PAGE if you only want to go through the Convention events) - Completed May 8th. April 7th - Thursday - Custom Class & Club store (WARNING - Big page of photos) - Completed May 8th. April 8th - Friday - BotCon day 1 & Golden Ticket dinner & Concert - Completed May 10th. 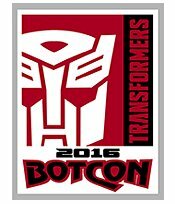 April 9th - Saturday - BotCon day 2 & Awards dinner - Completed May 11th. April 10th - Sunday - BotCon day 3 - Completed May 11th. April 11th - Monday - Journey Home (arrive April 13th) - Completed May 14th. Pre-registration Package pickup (Wednesday) - Completed May 8th. Club Store Toys (Thursday) - Completed May 8th. Dealer Room (WARNING - Big page of photos) - Completed April 27th. Art Contest Display & Costumes - Completed April 27th. Display Case 1 (Titans Return Fortress Maximus) - Completed April 27th. Display Case 2 (Titans Return - Deluxe, Legends, Titan Masters) - Completed April 27th. Display Case 3 (CW Computron & Titans Return - Leader, Voyager) - Completed April 27th. Display Case 4 (Platinum Edition, SDCC & Combiner Wars boxsets) - Completed April 27th. Display Case 5 (CW Victorion & RID - Power Surge, new Warriors, Legion, Minicons) - Completed April 27th. Display Case 6 (CW Gen2 Bruticus & RID - Platinum Edition, old Warriors, Battle Packs) - Completed April 27th. Display Case 7 (Merchandise & Alt-Modes) - Completed April 27th. 8am-4pm - Custom Class (Nunn or Breathitt Room - Suite Tower) - Completed May 8th. 9am - PANEL - TCC Magazine/Comic Panel with Pete Sinclair & John-Paul Bove (Cochran/Addition - Rivue Tower) - Completed May 10th. 10am - PANEL - Stan Bush & Vince DiCola - Completed May 12th. Noon - PANEL - Beast Wars Voice Actors with David Kaye & Venus Terzo - Completed May 12th. 1pm - PANEL - Script Reading starring Judd Nelson, David Kaye, Venus Terzo & Gregg Berger - Completed May 12th. 7.30pm - Golden Ticket Dinner (meetup Lobby 7pm - walk to Fourth Street Tavern) - Completed May 11th. 8pm - Hall of Fame part 1 (Fourth Street Live) - Completed May 11th. 8.30pm - Stan & Vince Concert (Fourth Street Live) - Completed May 11th. 10am - PANEL - Venus Terzo (Cochran/Addition, Rivue Tower) - Completed May 12th. 11am - PANEL - Hasbro Products - Completed April 28th. Noon - PANEL - Gregg Berger - Completed May 13th. 1pm - PANEL - Transformers Cosplay & Costumes with Rosemary Ward - Completed May 12th. 2pm - PANEL - Aaron Archer - Completed May 13th. 3pm - PANEL - Transformers Collectors’ Club - Completed May 14th. 4pm - PANEL - Judd Nelson - Completed May 13th. 7.30pm - Awards Dinner, Hall of Fame part 2, Casino night & Charity Auction (KICC Cascade Ballroom) - Completed May 12th. 10am - PANEL - Transformers Artists with various Artists (Cochran/Addition, Rivue Tower) - Completed May 14th. 11am - PANEL - Japanese Transformers Art with Hayato Sakamoto & Andrew Hall - Completed May 14th. 1pm - PANEL - BotCon Reflections Over the Years - Completed May 14th. What a weirdly emotional rollercoaster ride this BotCon was this year for me, with bouts of sadness from a couple weeks before it started, until a couple of weeks after it had ended, broken up by the usual periods of fun and excitement during the 5 days of the convention (but still dotted with a number of tear-filled moments, realising that this might be the last BotCon for a while, or ever, and any future convention format by Hasbro might not have the same fan-focus to draw us all back the next year). It's even been hard to complete this reporting of my adventure without a few waves of sadness and welling of tears in the eyes, on the thought of never seeing a number of my friends in person ever again. I haven't had this feeling of loss and finality since the last of my grandparents died about four years ago. Even though these friends haven't died, it just isn't the same interacting with them online. Could this really be the last BotCon? No one knows for sure, but the odds aren't good, while Hasbro have new plans for the global promoting of the Transformers Brand by taking back the Convention & Club licenses, while also creating a new Exhibiting license and selling it to a Singapore company for exclusive global rights to public Transformers exhibits. And with Fun Publications currently in possession of the trademarked BotCon name, a "BotCon" may not occur for a few years... and it might be the perfect excuse many of us (around the 40 year old mark now) who haven't already moved on from Transformers Conventions, to end it at the end of a set era. I guess the expression of, "be careful what you wish for" might end up ringing true for many fans, who wanted to see the license taken away from Fun Publications (not for how they handled the Conventions, but how they handled the Club and its customers)... but in the future, they might just regret it and end up prefering the "devil you know". Because they might not have been perfect, but is it better to have no BotCon at all? The location this year was somewhere new for me, but wasn't very exciting as a tourist destination... so it was probably a good thing that I didn't have much time in America this time. Looking online, Louisville and Kentucky seemed to be most famous for baseball (specifically the Louisville Slugger bat), bourbon, and KFC. I would have to see how many I could do or see in my five whole days over there. Being in the first week of April, this was the earliest BotCon ever, with the previous earliest ones being in the last weekend of April, in 2008 (Cincinatti) and 2012 (Texas). Due to the earlier time of year and being in the northern half of the country, it was very cold, with two of the nights being at about zero degrees celcius... which I only found out while at the Brisbane airport waiting to board my plane. Fortunately I had a jumper (sometimes the international flight can be cold with the airconditioning), and jeans (for the BotCon dinners). 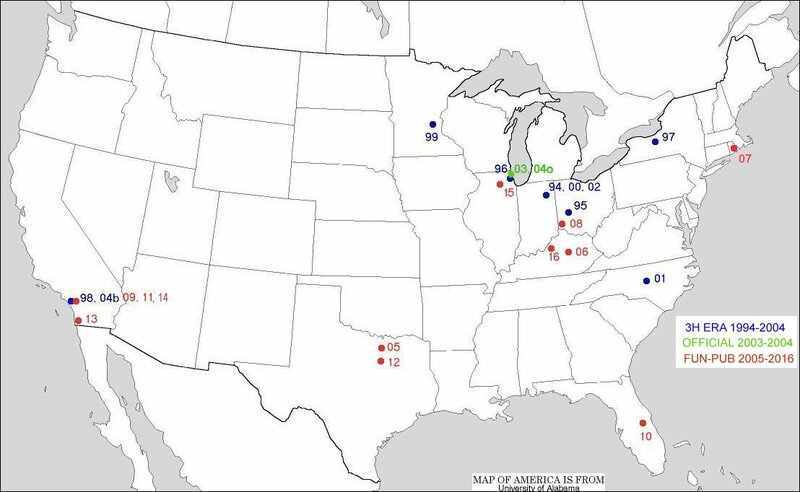 A map of the 22 American BotCon Conventions and the 2 officially endorsed Transformers Conventions. This is a map of my adventure this year. 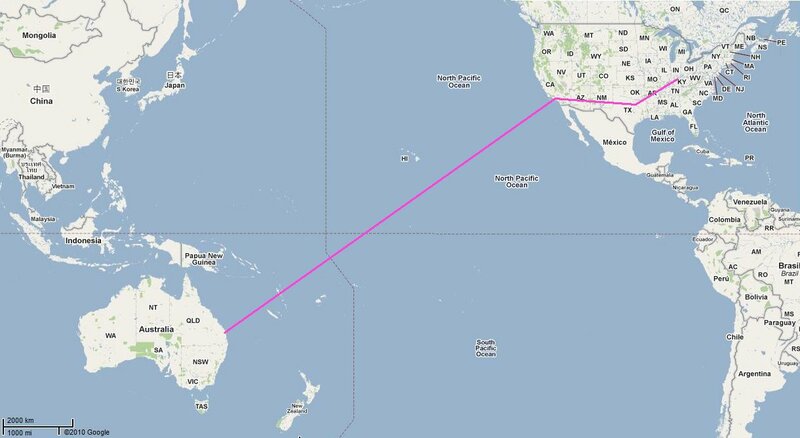 Brisbane to Los Angeles, to Dallas (Texas), to Louisville (Kentucky), then back again the same way. This year's adventure was one of my shortest since Fun Publications took over in 2005, with just 5 nights spent in America. Even though I had to catch three different planes in three different US states this year, none were new states for me, leaving me at the same number of 16 US states so far visited. That makes it a total distance travelled to the 16 BotCons and 1 Official Con (in 2003) of 495,025 km or 307,589 miles. Almost half a million kilometers... or 12.35 times around the equator of the Earth. As usual, my master Dispensor travelled with me again... popping up in quite a few of my photos. Plus a special mention to the two New Zealanders attending this year, one of whom I was sharing with (Andy). I could only find two others attending before 2016, making this year a record attendance from New Zealand. 1 - Guests and Panels - 6 - No IDW or Cartoon panel, David Kay was only there on Friday, and Sunday was completely dead day again for Panels, so why would walk-ins spend another $25 to come back on Sunday? 2 - Activities and Events - 9 - The usual features, plus the Stan & Vince concert on Friday. Both Hall of Fame events were spoiled by bad planning or management. 3 - Dealer Room - 8 - Very big, and lots of variety. But no IDW, a smaller Hasbro range on display, and the usual price-gouging on the hot items like Sky Lynx. 4 - Host city & convention location - 3 - Not as bad as Cincinatti in 2008, but probably the next worst if you don't have a car. 5 - Hotel Value & Features - 7 - An average room that had internet and cable TV included in the price, and the internet could be accessed everywhere, including the convention rooms. 6 - Cost/value of Convention - 7 - The Golden Ticket cost came back down from the Frank Welker expense of last year, but was still more than usual, and I didn't get much of it back as I didn't buy as much for others. 7 - Administration of event - 6 - Most panels were late this year, the Golden Ticket dinner clashed with the HOF awards, and the Saturday Dinner seemed unorganised. 8 - BotCon Merch & Toys - 8 - I will never be a fan of more than 6 BotCon toys each year, or keeping 2/3s secret when 2 have the same effect. As for the toys though, I wasn't disappointed by any this year. 9 - Interaction with others - 9 - Sharing with a NZer, plus spending a bit of time with another Australian, as well as several American friends, including some I haven't seen for years. 10 - Toys Acquired - 4 - I only managed one toy in the Dealer Room this year, plus 8 toy packs at Retail, thanks to a limited budget and expensive BotCon toys. That gives me a total score of 67, which puts it fourth-last of my 17 BotCons and Official Con, beating 2012 (65), 2015 (63) and 2003 (61). The lowest of the 3H BotCons was 68, but it should be noted that the highest score for a BotCon was actually a FunPub BotCon, in 2009, with a score of 82. A bonus category that is separate to the score above, because it doesn't relate to the actual convention - My Non-BotCon parts of the Trip score - 2. I actually have trouble giving it a 2 this year, as I didn't spend any extra nights in America outside of Louisville, and didn't do much outside of Convention hours while in Louisville (other than visit 2 toy stores and see the giant baseball bat near the Hotel). And with only 1-2 hours at any of my four connecting airports, I didn't have any time on my two travelling days to do any exploring outside of the airport (and both times at Dallas, I only had enough time to get to my next flight, with no time to see or eat other things on offer there). -- As a fan of the Combiner Wars moulds, the toys this year were average or better for me. And I think they all worked in at least one mode, if you go by their cartoon colourings. -- Being able to personally meet and shake hands with Judd Nelson (at the Golden Ticket dinner). -- The only toy I managed to afford to buy in the Dealer Room was the hard to find Japanese ToysRUs EZ Optimus in Geoffrey colours... plus the Kabaya Seacons Model kits, which were also hard to find for a good price. -- It was good to have a brand new actor/voice actor guest there this year (Judd Nelson), even if he only had two very short roles in the Transformers Universe. His appearance though was very brief, and he looked very scruffy. -- After failing to find an Australian to share a hotel room with, or a non-Australian I trust, I ended up sharing with someone from New Zealand (Andy), which was a lot of fun, as two outsiders to the 95% of Americans there, sharing stories, and hopefully helping him make the most of his BotCon from my years of experience. -- Witnessing what should be the last time Stan Bush and Vince DiCola perform together live, performing their various Transformers pieces. There's always a dedicated crowd to their performances, but even if there were still BotCons in the next few years, they wouldn't return for at least a couple years, and by then there would be even less interest in their 3 or 4 Transformers songs and music for a BotCon organisor to prioritise the cost of them both doing another live concert. -- It was also good to see Aaron Archer at a BotCon again, as he had been the most frequent Hasbro employee at a BotCon before he left, and it was good having him on a panel to share his story about his time with Hasbro. -- As always, the Custom Class is a highlight of the whole convention experience, and this year with the purchase of an unpainted assembled toy, we were given stickers and heads to create two different toys - Ratchet (one of several) and Medix. 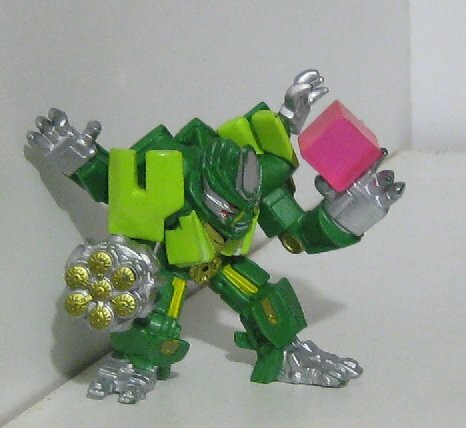 Plus, the Gen1 Ratchet sticker sheet included stickers to give the toy its Gen1 toy robot face (the black square face). What an awesome easter egg. -- The Golden Ticket dinner is also a favourite of mine, but this year I had to leave it early to see the Stan & Vince concert from the stage level, and it didn't give me much time to find more than two of the guests (David Kaye and Judd Nelson). -- The Hasbro people were once again pleasant and keen listeners, despite it being an exhausting 3-day weekend for them. -- Despite one of the earlier announcements of a BotCon, at some 6 months before the event (the first week of September 2015), they had promised to have registration happening "in the coming weeks", but it didn't end up happening until over 4 months later in mid-January. At least it wasn't as bad as the 5 months delay of BotCon 2015, but only by a couple of weeks. -- It could be the last BotCon for a while, or at all... or at the very least, it would be the last of the current format. It wasn't a perfect format that FunPub were willing to change, but there were a number of elements that were good and unique to FunPub BotCons that will be missed. -- I have a feeling that the next format of endorsed/official Transformers Conventions will have a different focus to it, aimed at the main customer demographic of Transformers, and won't draw us long time, dedicated fans back, meaning that I might not see any of my friends (and the regular familiar faces each year), in person again. Nor would I see too many more of the Voice Actors and creative people behind Transformers, unless I start going to some of the fan-run unofficial Conventions. -- The location was very boring, with the nearest toy source being about 20 minutes away by taxi. It also meant that there was very few exciting things to do as a tourist, which meant that the two pre-Con tours didn't interest me much at all. And since we were located close to the CBD of the city, aside from a restaurant and live entertainment area five blocks away, there was very little else near the Hotel and Convention Centre, especially on the weekend or after hours. It reminded me a lot of the 2008 BotCon in Cincinatti. -- I had limited spending money because I was late in deciding to go this year, and since the Convention toys cost several hundred dollars each year, most people like me are left with little or nothing left for the Dealers, who pay hundreds of dollars for tables in the Dealer Room. And since the Dealer Room doesn't open until a day after the Club Store, the Club Store gets to drain hundreds of dollars out of the wallets of attendees before the Dealers get a chance. -- We had two feature guest cancellations this year, which is a record, and one of the remaining feature guests could only be there on the Friday, so the walk-ins missed out on three of the Beast Wars Voice Actors in this Beast Wars anniversary year. -- Judd Nelson was an odd choice for a VIP guest, considering his very very minor roles in Transformers over the last 32 years. Peter Cullen would be more applicable as a VIP guest, and fans would have paid the $100+ price tag if it got them all the exclusive items that were on offer for Judd Nelson (professional photo, autograph, front row at the panel, print and pin). FunPub weren't able to sell all their VIP tickets for Frank Welker last year, and he was a major person in Transformers that most fans wanted to see, so I wouldn't be surprised if they failed to sell most of their Judd Nelson VIP tickets this year, which probably would have cost them a lot of money. I could think of a dozen other expensive Transformers actors or voice actors that would have been a better draw card. Actually, having one of the major Movie actors would have been a great publicity tool, for non-Transformers fans and media organisations to come to the event (like Josh Duhamel, Shia Lebouf or Mark Wahlberg, or gasp... Michael Bay). -- The Costume standards were down again this year, after a spectacular few years up until 2014. Not that I will complain too much about it as they are done by regular people voluntarily, for their own amusement and for the amusement of others (especially the kiddies). -- For the second year running, I messed up the construction of my Custom Class toy, preventing it from being able to take on vehicle mode. -- The weather was really bad, and cold that weekend. Of the six different days I was there, only one had more than half a day of sunshine or blue sky, and only a second day had the sun appear through the clouds (albeit very briefly). Three of the days it was raining, while two of the nights were one degree on each side of zero (celsius - about 32F). -- Hasbro's presentation and product display keeps getting smaller. Very few new reveals, Rescue Bots completely ignored, and almost nothing new shown off for RID. Plus, nothing about the RID cartoon, or the Combiner Wars "cartoon". -- Another very small turnout of Australians this year. There were just three other known Australians there this year, and I was only able to interact with one of them for more than five minutes. The last time we had enough Australians for a group meet or dinner at BotCon was 2011. -- The Awards Dinner and both Hall of Fame presentations seemed very poorly managed. The Awards Dinner was a very casual event that had most people stuck in the food queues when the HOF announcements and speeches being made, so people like me weren't able to see or hear much of it (or be able to get up closer to take some photos). And the Friday HOF presentations were at the same time as the Golden Ticket event, which we could have started after the presentations were made (or at least told about before we got our plates of food and were stuck in the sports bar until after it was over). -- Missing out on buying the Adventure Runabout toy and the Cyber Commander toys in the Dealer Room due to lack of funds, as I spent US$463 at the Club Store just for their items this year. That's a lot of spending money that the Dealers miss out on from attendees, just so that there are about 15 BotCon toys each year, when the convention should be focussed more on the experience of the events, not the expensive exclusive toys. -- No direct flights between Los Angeles LAX (the second largest airport in America) and Louisville (the largest city in Kentucky, and the largest airport for a Kentucky city - the Cincinatti airport might be just inside the border of Kentucky but it serves the Ohio city of Cincinatti). I had to take two planes to get there, which meant wasting several extra hours on both days of travelling, when I would have preferred to be toy shopping in LA or Louisville. As such, there was only one pair of flights to Louisville from LAX that got me there with time to check in before the package pickup on Wednesday night. All other options would get me there too late, or didn't give me a buffer in case of delays getting there. Even though I was arriving at Los Angeles at 6am, it seemed absurd that I would have trouble getting just halfway across America to Louisville within 12 hours, considering that the flight to America from the other side of the world was 12 hours. -- The return home from Louisville was a nightmare, thanks to bad weather causing my first of three flights to spend an extra 2 hours in the air. If it had been just another five minutes late I would have been spending an extra night in America, as I missed my connection in Dallas, and only just arrived at the gate of the last plane to Los Angeles as it was half boarded. 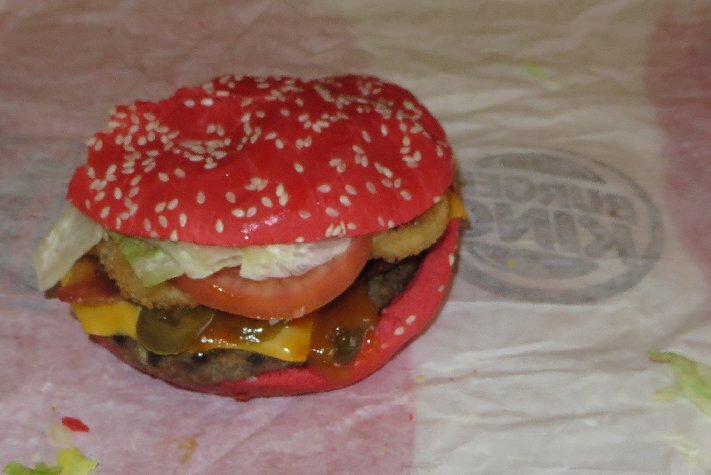 -- It wouldn't be a BotCon if I didn't have some burger photos, and this year I found the Burger King "Angriest Whopper", with four hot elements - hot sauce, jalepenos, hot "angry" onions, and bread with hot sauce in the dough. 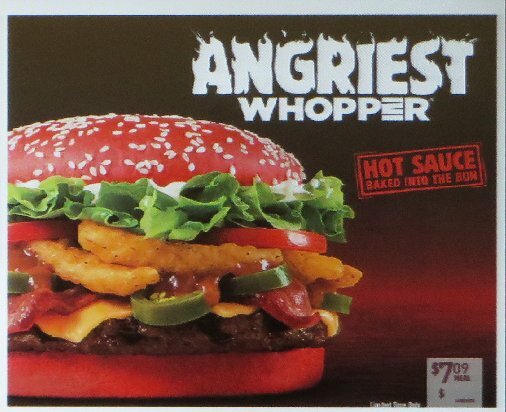 The Burger King outlet at the Louisville Airport that I got this at didn't have the Angry Onions in stock (they put in regular Onion Rings), so it ended up only being three-quarter strength of the advertised hot burger.